Business Chat is a new way to communicate with Apple and other businesses using conversational chat. Business Chat integrates with the built-in Messages app on iPhones and iPads, and allows consumers to contact companies directly via the service. 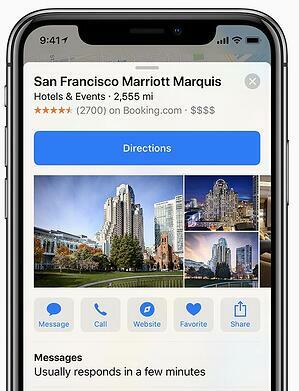 Apple has added support for Business Chat in Maps and the Safari web browser as well as Search for iOS. Customers with enquiries can tap a Messages icon in the apps to start conversations with companies they are looking up.Furthermore, Apple Pay is also built into Business Chat, allowing customers to make payments directly from the Messages app. Apple launched a US only beta of Business Chat with iOS 11.3 in March 2018. While it is still in beta this week it has been expanded to 10 more countries and 30 additional brands. Harvey Norman is the other Australian brand singled out for inclusion by Apple. Telstra are being low key about the trial of the new service. "We introduced Apple Business Chat to our customers this week. 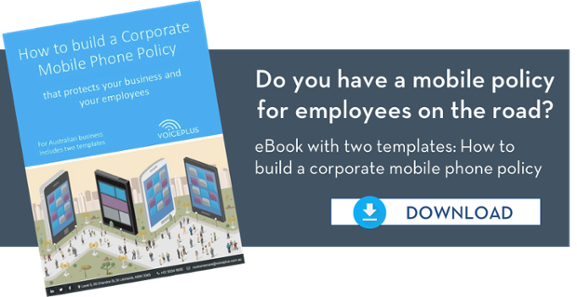 We are trialling this with a small number of customers to begin with, so we can evaluate customer engagement and feedback," a Telstra spokesperson said. "While it’s early days, customer response has been positive." Telstra has had its own 24x7 chat for a while but users are prompted to "Chat with Messages" if they browse the Telstra website on a compatible device. 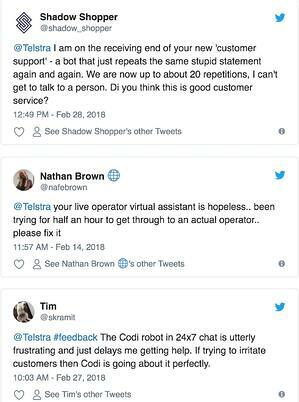 Telstra also launched its first customer service virtual assistant - named Codi - in March but initial customer experiences were negative with many venting their frustration on social media. No one's quite sure whether Codi is still in use or how often although a search on the Telstra website finds a page that suggests he does still exist and "has taken up virtual residence on Telstra.com, My Account and in the Telstra 24x7 app." When Business Insider attempted to use the chatbot, back in March 2018, they were directed to a human customer service agent who said Codi "was still available from time to time”. Telstra launched Codi in partnership with IBM and LivePerson. LivePerson is also the company involved in Apple Business Chat. “Conversational commerce is becoming a standard, because conversations are the oldest, most natural way for consumers to interact with a brand – there is no interface to learn,” said Robert LoCascio, founder and chief executive of LivePerson. Meanwhile only one in 10 CIOs will consider funding chatbot initiatives, according to a global survey held earlier this year. The survey of 842 Young Presidents Organisation identified the most popular subjects of technology investment this year are business intelligence (65 per cent), cyber security (47 per cent), digital/mobile payments (44 per cent) and internet of things (41 per cent). The least popular destinations for technology investment are virtual/augmented reality (23 per cent of CEOs planning to invest in the next 12 months), blockchain and distributed ledgers (15 per cent), chatbots (13 per cent) and cryptocurrency (9 per cent).